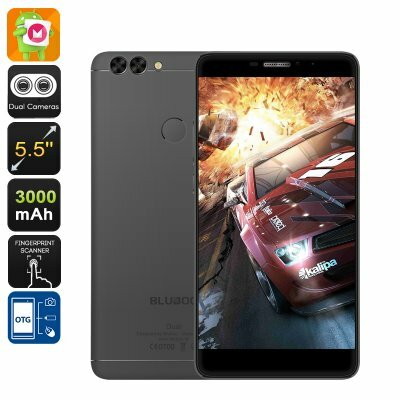 Successfully Added Bluboo Dual Smartphone - 5.5 Inch FHD, 4G, Dual-Camera, Quad-Core CPU, Android 6.0, 3000mAh (Black) to your Shopping Cart. The Bluboo Dual is one of the latest Android phones launched by this well-trusted Chinese smartphone manufacturer. With its sleek design, this Bluboo smartphone is merely 8mm thick giving it, along with its aluminum body, a high-end touch and feel. Packing an absolutely stunning 5.5-inch Full-HD display, this Android smartphone lets you enjoy all the phone has to offer in mesmerizing detail. With its extra-wide viewing angle and high pixel density, you will be able to enjoy a true cinematic experience in vivid color from the palm of your hand. One of the top specs of this latest android phone surely are its ground breaking dual rear cameras. Packing two lenses with separated sensors, you will be able to take your mobile photography skills to an entirely new level. Snap professional-grade photographs with great depth effects and stunning clarity, this 13MP camera allows you to capture all those special moments in life in absolutely breathtaking quality. Coming along with two LED flash lights, you will be able to snap the perfect picture at both day and night. Packing a whopping 3000mAh battery, the Bluboo Dual lets you enjoy all your phone’s features for countless hours continuously without needing to worry about running out of juice. With its Quad-Core CPU and 2GB RAM, this Chinese phone offers a powerful performance that allows you to enjoy all your favorite Apps, games, movies, and more without ever slowing down your device. Having the option to upgrade your internal 16GB of storage with an additional 256GB externally, ensures that this phone always has some space available for you to store all your files and media alike. From now on you’ll be able to carry around countless hours of mobile fun and entertainment within your pocket and make sure that you’ll never be bored again. Whether you like to watch a movie, play a game, or simply enjoy the latest applications – with the Bluboo Dual you’ll always have enough space to download and try out the latest media available. By supporting Dual-SIM card slots this Chinese smartphone allows you to easily switch in between two network providers, significantly increasing your over-all connectivity. With its 4G connection, this phone lets you enjoy the fastest data speeds out there - allowing you to browse the web in lighting speeds and stay connected with friends and family back home no matter where you’re located. From now on you can be assured that you’ll always be within reach for your friends, family, and colleagues back home, as with this Bluboo phone in your pocked all your loved ones are only a phone call away. The Bluboo Dual comes with a 12 months warranty, brought to you by the leader in Android phones as well as wholesale electronic gadgets..